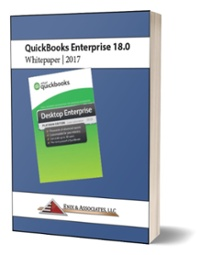 QuickBooks Enterprise Solutions' conversion to QuickBooks Online is different than converting a QuickBooks Pro or Premier company file to QBO. In short, it's not as easy or straight-forward but with a few tips we can help make it possible. First of all you must be using Internet Explorer 10 or higher. The file will be saved with a ".OE" extension. I would recommend saving this to your desktop for easy retrieval. Once you click save, your company file will be converting to this .OE format and could take some time depending on the size of your data file. Select QuickBooks for Windows 2005 and below. The Getting Ready screen will list the requirements to upload the file. Check off any applicable boxes in the Import Checklist. You will receive a message which warns that all data in the QuickBooks Online file will be overwritten. Install the Active X control on the computer. NOTE: Initiating the installation of the Active X control may cause you to repeat the above steps. When the Active X control is installed, you will receive a Congratulations window. Hover over QuickBooks for Windows 2005 or earlier. Follow the instructions to export the file from QuickBooks Desktop, or click the box "Yes, I've prepared my file for import". Click Browse to navigate to your saved OE.qbw file. Select your saved OE.qbw file. Select the type of import you wish to use. If an Admin password existed in the desktop file, you will be prompted to enter it now. You will see your file start uploading with a Toolbar moving towards 100%. NOTE: Closing this window by any other method than clicking Continue will prevent the file from uploading. Once the upload reaches 100%, click Continue. You will be locked out of the file while the upload is completed and imported. Click Sign Out of QuickBooks Online. You will receive an email when the file has been fully imported and is available for use. My experience has been it only takes minutes for your file to be ready versus the 24 hour expectation Intuit puts on the screen. Obviously they are giving you a worst case scenario expectation. IMPORTANT: If at any time during these steps you are blocked from continuing you may need to add *.intuit.com to your Trusted Sites. At the top right of the Internet Explorer click on the gear icon. Then click on Internet Options. On the screen that follows click on the Security Tab. Click on the "Sites" button in your Trusted Sites as shown below. Type *.intuit.com in the Add this website to the zone field. Click the Add button. It will drop down into your trusted websites zone. Make sure to uncheck the box next to "Require server verification (https:) for all sites in this zone." I trust this information has been helpful. Check back often to learn more Tips & Tricks about QuickBooks Online!